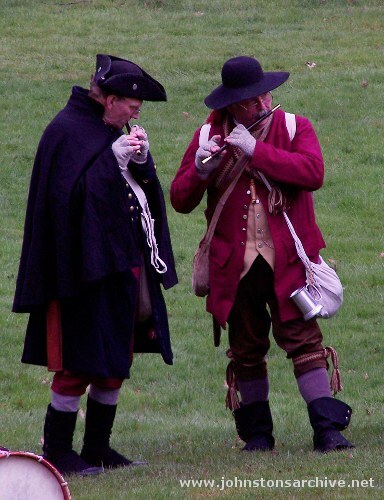 On 19 April 1775, British General Thomas Gage, military governor in Massachusetts, sent 700 troops under Lieutenant Colonel Francis Smith and Marine Major John Pitcairn to seize militia weapons in Concord. 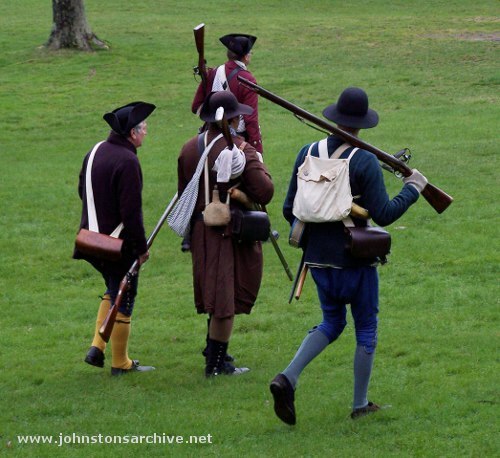 The Revolutionary militia learned of the plans and had time to assemble armed resistance and meet the British troops at Lexington. 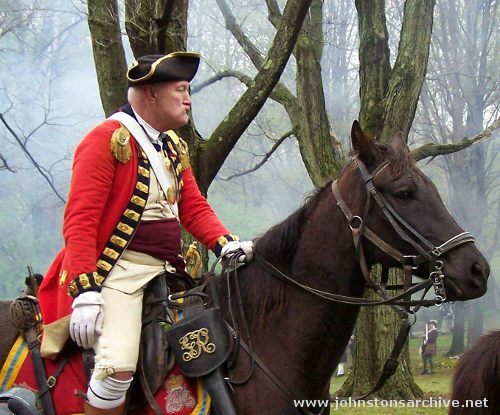 When confronted by the British troops at Lexington Green, militia leader John Parker ordered his men to disperse. 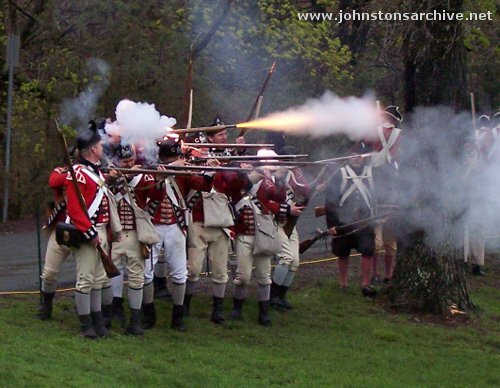 A shot was fired, and the British responded by firing on the militia, killing eight. 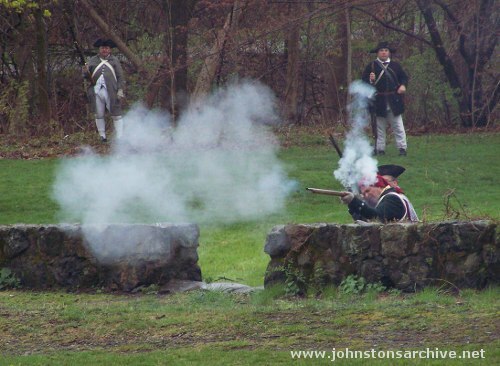 These were the first shots in the American Revolutionary War. 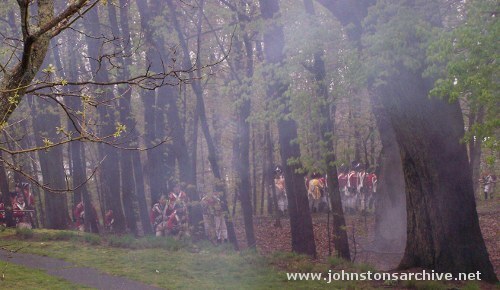 The British troops proceeded to Concord and were confronted by militia at the North Bridge, where Revolutionary militia fired on the British, who began retreat towards Boston. 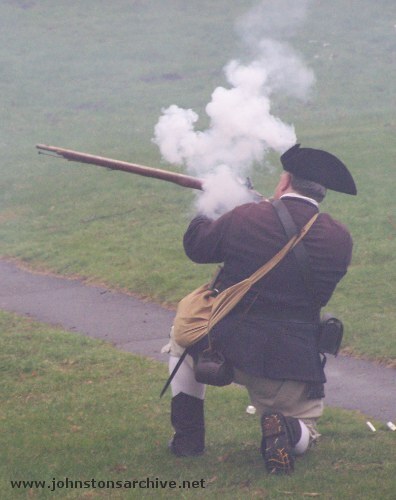 These were the first shots fired by Revolutionary militia at British troops, the first one dubbed "the shot heard 'round the world." 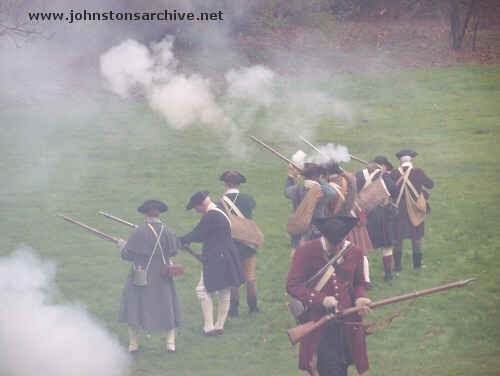 During this retreat the Revolutionaries progressively gathered and attacked the British, leading to a running series of lesser confrontations to Lexington. 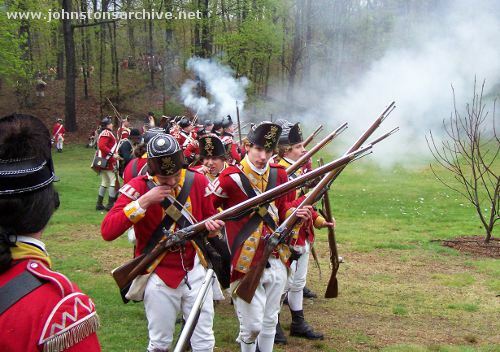 Just past Lexington, the British troops joined a British reserve force of 1,000 troops equipped with cannons, used to disperse the pursuing Revolutionaries, allowing the British to regroup for their return to Boston. 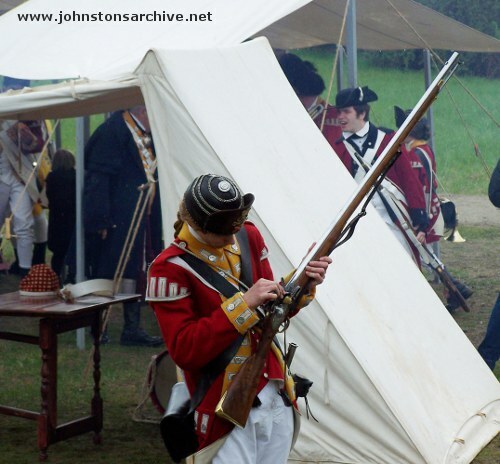 Conflict between the British and colonial forces intensified during this retreat. 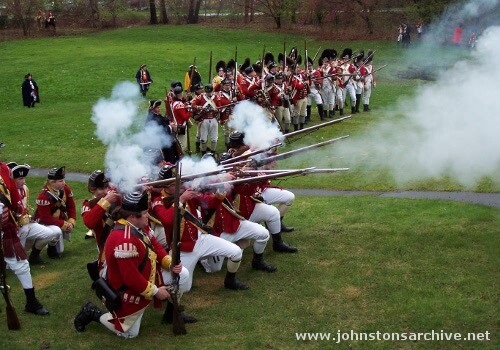 Revolutionary forces laid seige to the British forces in Boston. 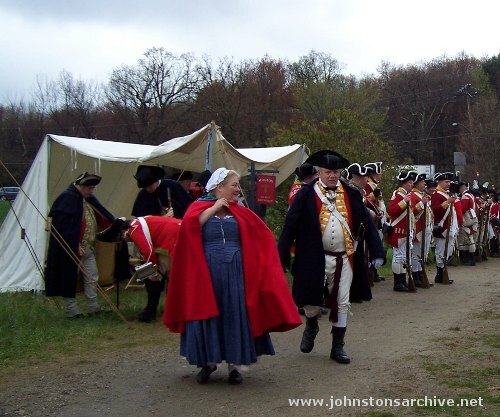 The colonies would of course declare independence the following year, 4 July 1776, and successfully secure this independence from Great Britain. 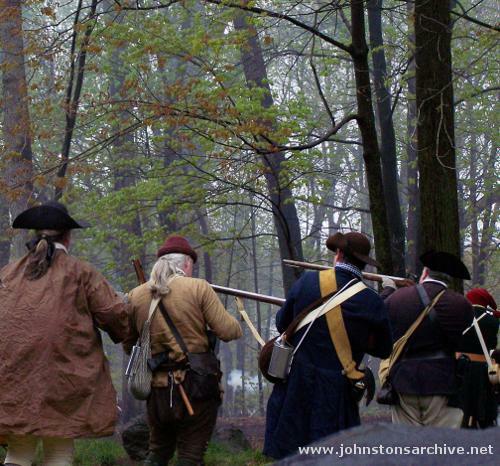 The events of 19 April 1775 are now commemorated in Massachusetts as Patriots Day. 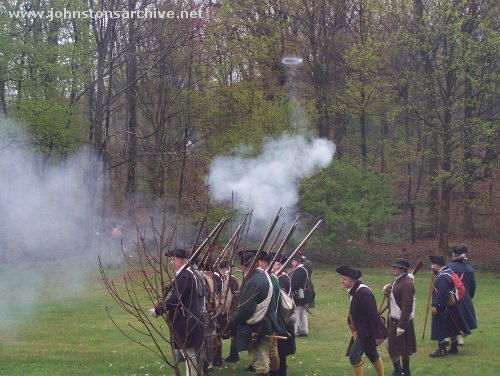 These pictures are from a battle reenactment on 17 April 2010 in Lexington, Massachusetts, and from reenactments at Minuteman National Historic Park nearby. 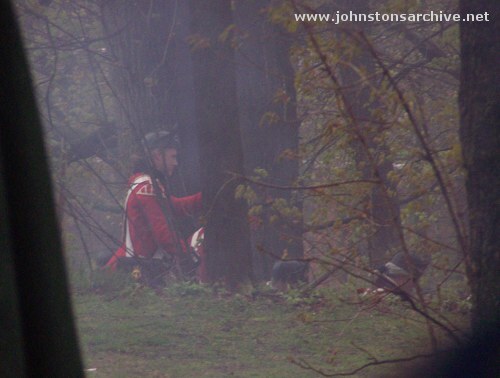 Goto Part 2 for more pictures. © 2010 by Wm. 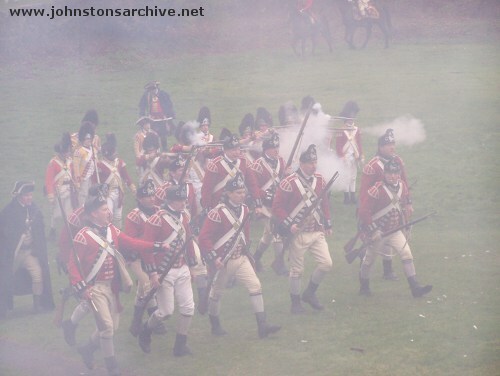 Robert Johnston. Last modified 24 April 2010.